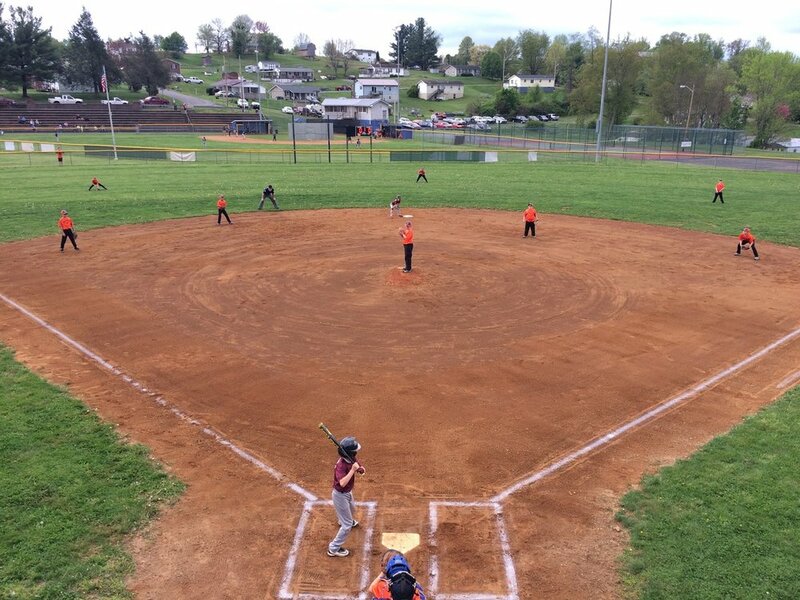 The league sought FOSER assistance with improvements to one of their two Little League fields in the heart of the town of Glade Spring, VA, population 1500. The league is celebrating their 50th anniversary in 2017. Due to years of maintenance issues due to local budgetary constraints, and unforeseen natural occurrences (such as a sinkhole that required the town to fill and stabilize the area), the league had been unable to use field 2 and was limited to the use of only one field for all their Little League games. FOSER provided $3,308.59 towards the project costs for 40 tons of infield mix, paint and other small improvements for the dugouts, and the purchase of new home plate, pitcher’s plate and safety bases. The Town of Glade Spring provided the balance of the funds to complete this project, which was done in time for Opening Ceremonies this spring. Abingdon LL undertook a project to upgrade access stairway from the main entry to the Little League field and pour concrete pavilion area around concession and bathroom facilities and extended area in order to improve safety and increase handicap access. Labor was donated by a local concrete contractor, and materials to complete the project amounted to $5,500. FOSER funds were requested to close the funding gap and allow the league to complete the project. FOSER approved $1,000 that completed the funding for the project. Winston Salem National Little League, one of the oldest leagues in Winston Salem, is in the process of implementing a renovation project to update their four field complex. The most pressing need is to replace wooden bleachers that have fallen into serious disrepair and become a safety issue. The league is prepared to provide the labor necessary to complete the project, and asked FOSER for assistance with the purchase of materials. The total project costs are estimated at $4,851.89, which would cover the costs to repair/replace nine sets of bleachers. After discussions with the league, FOSER approved a grant of $2,000 supporting this project. Bristol Little League is starting a Challenger program, and requested support for purchasing a backstop for the field they will use for this division. FOSER support for this purchase will allow the league to improve safety conditions at the field prior to the start of play. Bristol LL hopes to expand their Challenger program to support a year round program of activities for the children in their program. Shore Little League has been chartered for 61 years, and is the only league in the county with an estimated population of 12,389. They have five playing fields, and in 2016 had 259 players on 22 teams, 80 volunteers and avenge game day attendance of 400-500. They currently have four bleachers that are steel frame with wooden seats and footboards. The boards have been replaced over time, but they are in desperate need of replacement and are becoming a safety hazard. The league requested $1,877.16 of an overall project estimate of $2,077.16 to purchase two three row aluminum bleachers as the first stage of a five year project to provide aluminum bleachers on all five fields. FOSER funds made this initial project possible. After being notified of the FOSER grant, the league was able to obtain an additional grant allowing them to purchase a second set of bleachers, moving them even closer to their goal. Lake Mary LL envisions sponsoring an instruction and training program for both league volunteer coaches and players to help improve skills and provide the kinds of instruction that many currently perceive as only being available outside of Little League. They propose to engage local high school coaches, local D1 Sports Training facility as well as the Florida League on ways they could engage with them to share their experiences and guidance to help train coaches and players. They would use the funds to sponsor clinics as well as weekly conditioning programs focused on conditioning that applies not only to baseball, but also helps players learn lifelong fitness skills. They also propose to develop very targeted marketing of their programs to age appropriate grades in their schools to share more information about the league and options that exist, such as how to combine participation in Little League with school baseball. FOSER has approved a grant of $2,500 for this training and promotion program, subject to development of a more specific proposal and a timeline for implementation. Towards this, FOSER has approved providing up to $1,300 as the project is developed. FOSER believes that the experience gained from this project could lead to opportunities to replicate the approach elsewhere to strengthen leagues and baseball skills.